From the developer: Dungeons and Spiders came out when I noticed some interesting puzzles on the italian newspaper "Focus Giochi". I made this game and shown it to the original author of the games, which was very pleased. 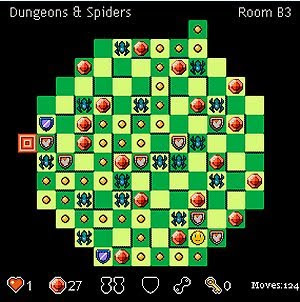 Dungeons & Spiders is a fresh puzzle game where you must escape a labyrint, avoiding spiders and collecting treasures; but be aware - You cannot step twice on the same tile. There are special bonus with different effects, be sure to check the "How to play" section in the game itself.